There are several diseases that attack pepper leaves and fruit during production in North Carolina. This bell pepper fungicide spray guide, developed by NC State University and updated annually, provides products that are effective against these diseases. The College of Agriculture and Life Sciences at NC State provides information on crop protectants for controlling diseases of various vegetable crops in greenhouses. This publication from NC State University’s, College of Agriculture and Life Sciences provides information on the symptoms, disease cycle, and control options for southern blight of vegetable crops. The NC State Extension publication provides information on how to avoid and treat high soil salt injury of vegetable crops. This publication created by NC State University and College of Agriculture and Life Sciences provides information on symptoms, causes, controls, and field cautions pertaining to bacterial leafspot of peppers and tomatoes. The College of Agriculture and Life Sciences at NC State created this publication to provide information on the damping off disease of flower and vegetable seedlings, providing details on symptoms, causes, and controls. soils, and other environmental stresses are thought to be more prone to infection. There are many varieties with resistance to Fusarium wilt of commercial fruit and vegetables. Fusarium oxysporum f. sp. lycopersici has three races; race 1, race 2, and race 3. 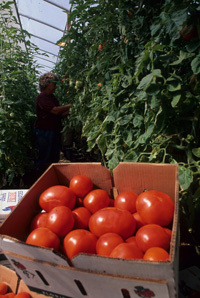 Some tomato varieties may be resistant to one race, yet completely susceptible to another.